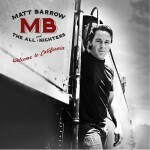 Matt Barrow And The All Nighters » BACK AT THE 32!! Home » Events » BACK AT THE 32!! We are playing Ireland’s 32 again!! Join us for another full night of raucous rock n roll and shenanigans! !